Hip Candy : Cavalli At H&M in Chicago.. GONE. 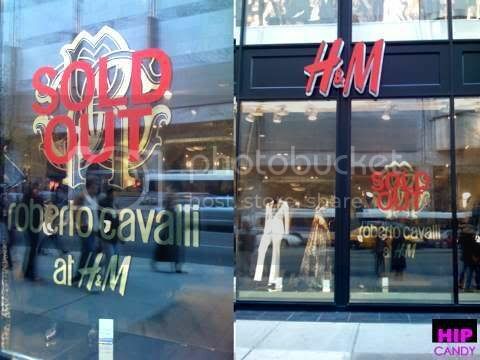 Cavalli At H&M in Chicago.. GONE. This is the sign that greeted me loud and clear when I arrived at the H&M on Michigan Avenue in Chicago last Friday morning November 9. Roberto Cavalli at H&M, GONE. ALL OF IT. It had only been released 24 hours before on Nov. 8! When I asked an H&M associate how long the Cavalli collection had all been sold out, she told me that when she got to work at 3:30 PM on Thursday the day of the launch, that there were only a few pairs of Cavalli men's underwear left. That's it! Another sales girl told me (as I was paying for another really cute dress and top I picked up..) that the H&M Cavalli collection (with pieces that ranged in price from $80 - $100 in the store) will have a whole new existence on Ebay. She told me that some people were there specifically to buy it out at the store, only to turn around and re-sell it (at a premium too, I might add) on the popular auction site. So if you really, really want a piece of the Cavalli collection from H&M, and you don't mind paying double, and in some cases triple the price, now you know where you can get it. Yes, it's the tarjay phenomenon and they do it with many of the designer lines there also. It's fucced up because people can't go get it in the stores for a reasonable price because these azz holes have purposely bought it all up and are selling it for 3 and 4 times what it's worth. I went on ebay today and noticed the cavalli h&m line on there...shoes selling for $300! Dresses for $400...jackets $500! It's sick. I don't know who the hell is STUPID enough to be buying the lines on ebay for that much extra...but they are truly retarded if they are.